One of only two concrete tilt slab 102m2 units, 7a Raymond is super cool and located in the thriving beach suburb of Pt Chev. Calling the The Board Store, Mars Salt and Sweet, Coyle Park, The Daily Bread and Pt Chev Beach neighbours, you couldn't be better positioned to take in the enviable lifestyle only Pt Chev can deliver. Set over 3 levels with two bedroom spaces, the lower level is dedicated to 'work from home'. 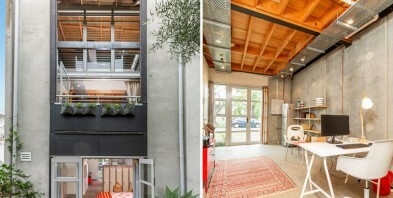 42m2 of high stud, polished concrete and a cool industrial aesthetic, double doors at each end welcome deliveries, clients or a perfect connection to the private courtyard at the rear. As independent of or, as connected to the home as you choose - there are a multitude of options for this valuable space. Level two houses the large vaulted ceiling living space. Soaring stud is an understatement, this really is New York Loft style at its best. A private sunny deck looks north east as an extension of the living and kitchen and the light and bright separate dining room gives great separation if required. Suspended over the living is the generous master bedroom space complete with ensuite. Pull down stairs lead to the roof deck, a complete 360 degree panorama of Auckland. Truly spectacular and well loved by our vendor and friends.